Perhaps the biggest surprise at the 2007 Frankfurt Musikmesse is the Solaris keyboard synthesizer from industry ‘old timer’ (his words, not mine) John Bowen. 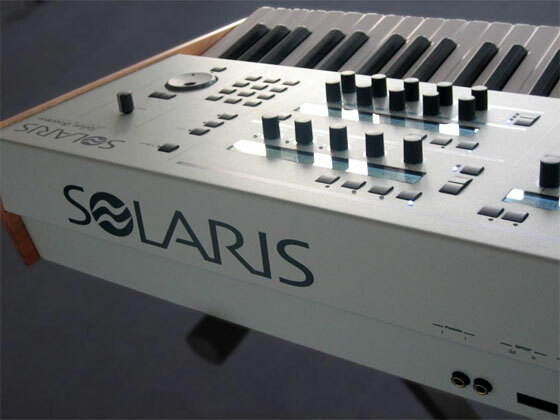 The Solaris is set to turn the electronic music world on its ear as the first hardware synth inspired by a softsynth. Solaris started life as a semi-modular software synthesizer for CreamWare’s Scope DSP cards, and it quickly gained a reputation as an unusually versatile device. I caught up with John a few days before Musikmesse to chat about his new instrument. John Bowen got his start in the music industry as a clinician for Moog in the early 1970s, before striking up a friendship and working relationship with Dave Smith of Sequential Circuits. He joined Yamaha for a short while in the late 1980s before moving to Korg as the product manager for the Wavestation. John also worked on the original Korg OASYS keyboard. Since 1998, he has designed a range of versatile softsynths for the Creamware Scope platform at Zarg Music. To develop the new Solaris keyboard synthesizer, John teamed up with Holger Drenkelfort and Juergen Kindermann of SonicCore in Germany. The team had previously worked on the CreamWare Scope system. They leveraged their skills to develop a brand new hardware and software design that uses Analog Devices SHARC DSP chips to crunch newly developed synthesis algorithms at 96 kHz. Sound quality is paramount. The result is a hands-on instrument with enormous programming depth and flexibility. It features high quality synthesis algorithms, a 5-octave keyboard and one of the most comprehensive front panels in modern history, offering a 240 x 64 graphic display, five 40 x 2 character displays and 40 rotary encoders. After spending more than a decade immersed in the software world, it’s remarkable to see Bowen return to his hardware roots. CDM: How did the Solaris come about? After all, it’s a great leap to go from producing softsynths to building hardware. I’d been involved with some fairly interesting and successful keyboard manufacturers in the past. The reason I went to software-based instruments was to have more freedom in design. When I was working with Korg or even with Dave [Smith] at Sequential, I had a fair amount of leeway, but there are always things that you’d prefer to have done differently and in a company like that it’s always a group decision. There are always compromises that are made, and one of the things that I liked about going to the CreamWare platform specifically was that it was easy for me to make designs that were uncompromised. It’s also fairly fast to test and try out different ideas in real time before making final decisions. The leap from software back to hardware is really more of a full circle. There are two things, in my mind, that made it happen. Many times I was asked to do a VST plug-in, and there was so much rampant piracy going on that I was never convinced it was worth my while. They gave me lots of numbers, and they told me, “Oh, by the way, 9 out of 10 will be pirated, so factor that into your equations.” Now, with a hardware piece you have a huge dongle that is not going to be pirated very easily, and that’s pretty attractive. I wanted to do something with a hardware piece out of the CreamWare product line. Years ago we talked about this idea that became the ASB platform. I talked with Frank [Hund, formerly of CreamWare] about initially developing a Prophet model (which he eventually produced). I did discuss with them about making an ASB version of the Solaris, because I was still searching for a way to get out of the software-only thing. The plug-in market for Scope had slowed down considerably, and I wanted to have something that had greater marketability. After my final discussion with Frank about an ASB approach, I realized it truly wasn’t powerful enough to pull it off; I got back in touch with Holger. We’d been talking on and off about doing things for a while and we decided, “We’re just going to do it.” So here we are. CDM: That was sometime last year? We started talking about it around April and the decisions were made in August. The actual development started in October. It’s all pretty recent. CDM: So where are you in the project? We have 2 prototypes and they are up and running. Since I’m a small, ’boutique synth’ business, I’m not too concerned about having to sell 10,000 of them like a larger company such as Korg would have to. There are advantages to being a small group. It takes forever to get a product out in a larger company, whereas here I have a very clear idea of what I want and I can just go for it. We can be streamlined. After all, it only took six months for Dave Smith to design the Prophet-5. I just want to get this box out there and have fun with it. I hope other people will enjoy it, too. CDM: What are you trying to do differently with this new instrument? I’ve seen a lot of popular hardware things come out that still have compromises in the audio. One of the things I’ve always liked to do is audio rate modulation of the filter cutoff or pulse width. That’s typical of the kinds of sounds I would go for in the old days, even with the Poly Mod on the Prophet-5. You still rarely see that kind of function provided because of the costs in overhead, either on native platforms where there is too much CPU being used or with machines that are built on [DSP] chips where it just takes too much power away. My mandate on the Solaris is premiere sound quality, maybe accepting less polyphony for higher quality. I don’t know what the final polyphony count is going to be yet, but I’m more interested in quality and usability. That is what I have built my reputation on. CDM: That’s interesting, because I remember you once asked whether people wanted more polyphony or more flexibility when you were creating your softsynths. I asked the users who had ordered a bundle of the first CreamWare synths that I made. I said, “I could go one direction and have more polyphony but less features, or the other way around.” Virtually everyone said, “More features, don’t worry about the polyphony.” I was pretty surprised, because we are in a commercial product environment where everyone is on this big numbers count saying, “What, there’s only 128 voices? Is that all?” It was interesting to see Dave Smith come out with just 4 voices of quality analog synth [the Poly Evolver] at a fairly expensive price. CDM: What sort of price are you aiming for? I don’t have the final hardware costs yet. Once you take a look at it, I’ll take your best guesstimate [laughs]. I have a ballpark figure, but I’m going to hold off floating it until we get past the show. We’ll be somewhere in between the Poly Evolver and the Waldorf Stromberg. CDM: Apart from some recent gear, there has been an absolute hardware drought. Everyone has been saying, “Well, gosh, it’s all going to software, so no one is going to buy hardware.” Everyone was so sure of that and everyone started to walk down that path. And then people started realizing that there is value in something that you can touch, feel, hug, caress – an instrument, for lack of a better word – that is not a mouse-controlled computer screen graphic, but something that you can lay your hands on and feel and get familiar with. I think maybe that tactile experience has been part of what people have been missing. Softsynths, for all their great advantages, have still left many of us older generation synth guys a bit unsatisfied, and we want to bring the quality back. CDM: Solaris has six displays and 40 knobs. That’s an amazing array of controls. A little crazy, maybe. When I sat down and took a look at my Solaris plug-in, I have a lot of pop-up menus in there and I couldn’t figure out how else to do it. I was originally going to do it as a tabletop synth, but it needed a more horizontal structure because it was too narrow and deep. There is room for a touch pad on the left side, but we couldn’t find the right part source. Instead, we will probably use a joystick. As it is, the controls fill the panel above the [5-octave] keyboard. CDM: SonicCore recently acquired the rights to CreamWare’s DSP library. That must be an exciting development for you. I’ll be able to exactly duplicate my plug-ins. The hardware is different, so it’ll take some translation of the code, which I don’t know how long it will take. Even without the CreamWare stuff, I’m excited to be doing something new with flexible virtual analog synthesis. We’ve been working on very accurate and faithful emulations using component analysis and non-linear modeling. I’ve even had talks with others about integrating some physical modeling, but we shall see. The important thing is to have a flexible interface, which is hopefully what I’ve done with the Solaris. CDM: What about the look of the Solaris? CDM: What do you think the future holds for the synthesizer industry? I’m not good at reading the future. Back in the Sequential days, Dave and I brought in one of the first [Yamaha] DX7s and I thought it wasn’t going to go anywhere because it was too grungy and noisy. Plus, who was going to be happy with such a difficult user interface? [laughs]. Every five years it seems that people are looking for something new. The [Access] Virus is now a decade old and it’s still hugely popular, but I hope to contribute something a bit different in the marketplace. You can read more about the Solaris at John Bowen Synth Design (the site is still under construction). The instrument will be available later this year.